A classic favorite for all ages. Sophisticated, sweet cocoa at the touch of a button! Purr-fect for any occasion. -Store Milk Chocolate K-Cup packs at room temperature. 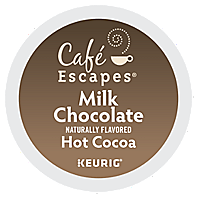 -Run a hot water brew cycle (without a K-Cup pack) after brewing Milk Chocolate Hot Cocoa.